Isn’t it a pretty little setup? This was just some leftover vegetables I had in my fridge. I am a very resourceful in general and don’t like to have waste, and in line with that, I was headed out of town and did not want my lovely fresh veggies to spoil! 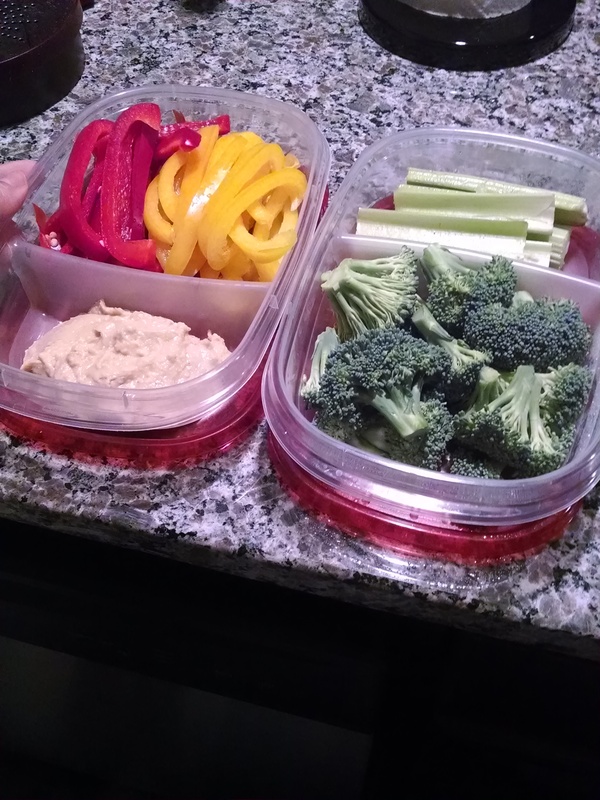 So, on the right, we’ve got fresh celery (benefits of celery) and broccoli (benefits of broccoli), and on the left, sweet peppers – orange and red (benefits of bell peppers), with 2-3 servings of Roasted Garlic (benefits of garlic) Hummus (I had Sabre brand, but there are others that are great, also). The peppers are especially kid-friendly because of their bright colorfulness and sweet taste. Makes for an enjoyable experience for both kids and adults alike!